I left for work yesterday morning and there was a very thin layer of frost on my windshield. Yes, it's true! So this means two things: 1) time to break out the winter scarf collection, and 2) time to break out the soup recipe collection. Both of which delight me when the temps fall. And they are fallin'! So I threw my long black scarf around my neck, and when I came home for lunch, I ate a cup of my Simply Healthy Black Bean Soup. I know what you're thinking—more calories, and the sodium count is still pretty high. But check out the fat calories. There's a significant difference! And when I generated these Nutrition Facts, I couldn't figure out how to reflect the act of rinsing and draining the canned black beans. There is, as it has been proven, a ton of sodium in all that gobbledygook. So what looks like 851mg is probably a bit less in reality because of this one simple trick. 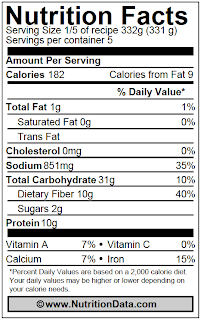 And let me remind you that the Nutrition Facts at left are a rough guesstimate for one serving. 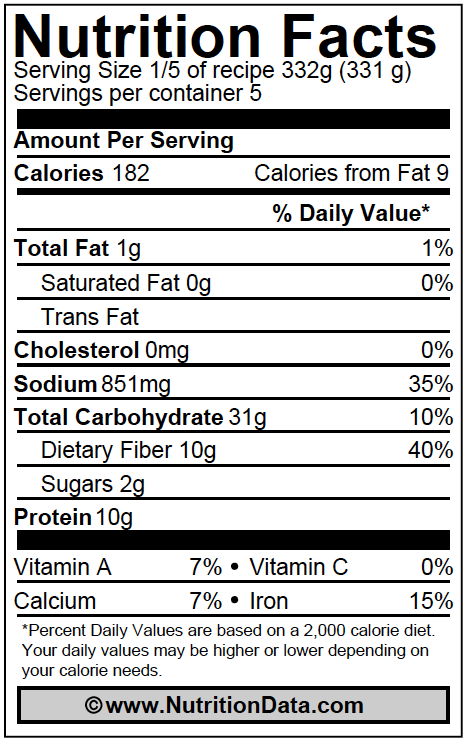 Read labels when you purchase ingredients to make sure that you are making the healthiest meal possible. That said, let's get down to the nitty gritty about those ingredients. 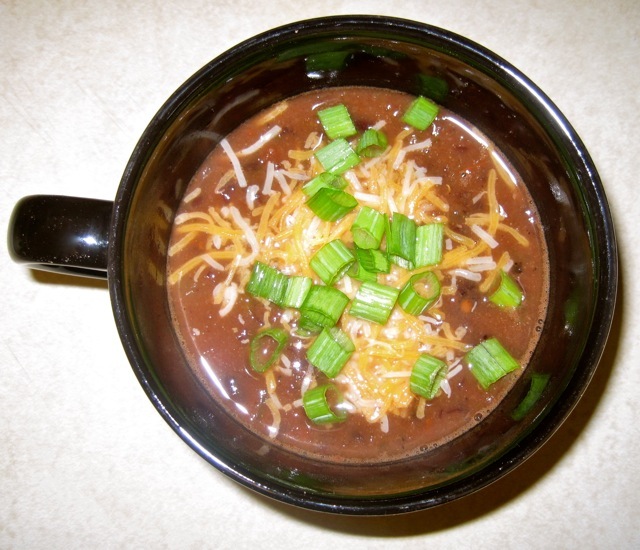 Behold the recipe for Simply Healthy Black Bean Soup, so called because it takes very little time or ingredients and is quite good for you. 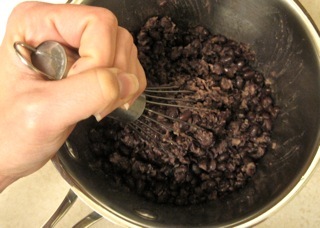 Put black beans in a small saucepan and mash with a whisk. You could also use a food processor, but the whisk works just fine and produces less of a mess. (Eh, seriously—I hate the lighting in my kitchen.) Add the broth and salsa, then the cumin and mix it all up. Bring to a boil, then reduce heat and let it simmer for a few minutes until it reaches a temperature that pleases you. Dish into five bowls, choose to freeze and/or refrigerate a few, then top the portion you intend to eat with green onions and/or cheese and/or sour cream. Yum, right? I used to make this ALL. THE. TIME. when I was living on my own. Not only is it simple and healthy, it's also incredibly easy on the pocketbook. Lucky for me, Jason isn't a huge fan of black beans—silly goose, he's missing out—which means all five servings are mine for the taking. One quick note, I've created a new topic (Recipes) under which you can find all of the recipes I've posted to this date. I don't claim to be an expert chef, nor am I a nutritionist. Just a personal trainer who likes to share healthy recipes that complement the fit life. And now you can find them all in one fell swoop!